A pumpkin roll is one of the top requested cake recipes when the weather starts to turn cooler after a hot summer. So let me show you my easy Pumpkin Roll recipe. I’m excited to share it with you! Use lots of powdered sugar; it will help you roll the cake into the towel. Allow the pumpkin roll to cool completely before you put on the cream cheese mixture. This is important. If you try to ice the roll while it is warm, it will begin to tear the cake, so keep that in mind. Listen, I will help you get through this time…just follow my lead! Alright let’s get you started on this easy Pumpkin Roll Recipe…are you excited?!? First things first. Gradually add the sugar to the eggs in a large bowl. You will want to beat the egg mixture with an electric mixer on medium speed for about 5 minutes. I know this sounds like a lot of time, but, you are looking for the air to make this cake light. Alright next grab your can of pumpkin and it in with your egg mixture followed up by adding in the biscuit & baking mix, cinnamon & pumpkin pie spice. Mix that concoction thoroughly. Spread mix onto a greased wax paper & place greased side up on a 10×15 jelly roll pan. ** If you are using pecans, sprinkle your mixture with pecans at this point. 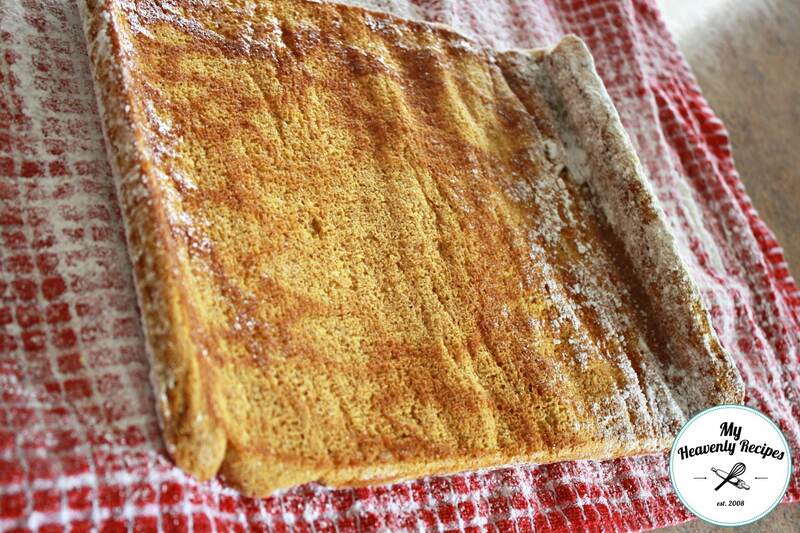 While your cake is baking, sift 1 cup of powdered sugar into a clean dish towel or tea towel. Then once the cake is finished baking turn upside down onto the powdered towel. Wrap the cake up into a roll inside the towel. You’ll then cool the powdered cake completely on a rack with the seam side down. While that is cooling down you can mix up the cream cheese & butter to make the filling. Stir in the remaining 1 cup of powdered sugar and vanilla. Now unroll the cake and spread cream cheese mixture and reroll the cake without the towel. I let my Pumpkin Roll sit in the refrigerate for 2 hours or so before I’m ready to serve. It just allows everything to set up and become one! TIP: You may need extra powdered sugar if covered in the fridge as some of the powdered sugar may come off. 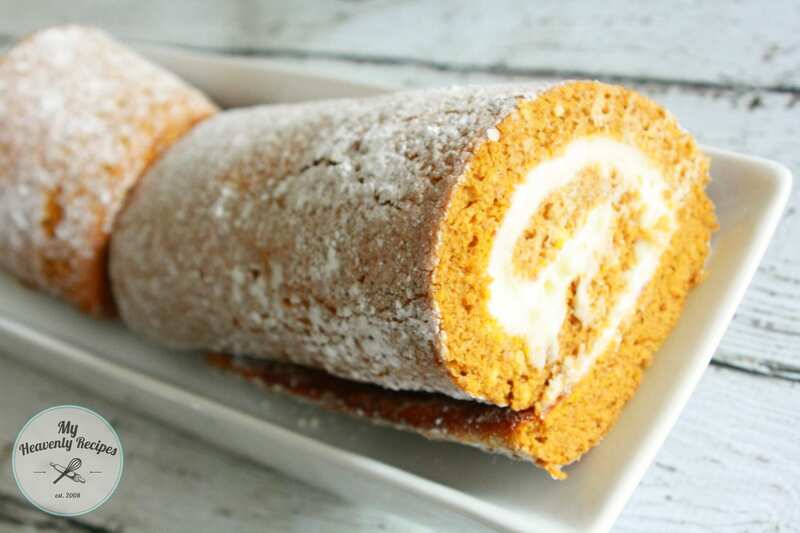 Now aren’t you excited to head into the kitchen and create your very own Pumpkin Roll? I guarantee that this easy pumpkin roll recipe will impress your friends and family. If you have time, you can make a small business out of it every September! I actually have a friend who makes about 50 Pumpkin Rolls every September as friends and family begin craving them! 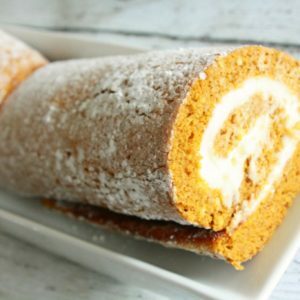 A super delicious and easy Pumpkin Roll Recipe. You won't be purchasing these anymore and guarantee the your friends & family will put in their requests to you! Spread mix onto a greased wax paper & place greased side up on a 10x15 jelly roll pan. ** If you are using pecans, sprinkle your mixture with pecans at this point. While your cake is baking, sift 1 cup of powdered sugar into a clean dish towel or tea towel. Then once the cake is finished baking turn upside down onto the powdered towel. Wrap the cake up into a roll inside the towel. You'll then cool the powdered cake completely on a rack with the seam side down. Now unroll the cake and spread cream cheese mixture and reroll the cake without the towel. I let my Pumpkin Roll sit in the refrigerate for 2 hours or so before I'm ready to serve. It just allows everything to set up and become one! ** You may need extra powdered sugar if covered in the fridge as some of the powdered sugar may come off. These cake rolls are always so so pretty, but the best part is how easy they are to make. Your pumpkin roll sounds wonderful! Thank you for sharing at Merry Monday! Thank you for stopping by Amanda. I hope you have a terrific Thanksgiving!